Grocon's master plan for the Southport site. The Commonwealth Games Village will provide services and accommodation for around 6,500 athletes and officials during the games. It will also include over 1,200 permanent apartments and townhouses across 30 buildings ranging up to nine levels in height, a neighbourhood retail centre over 6,000 square metres, village heart and active main street, plus a seven hectare park as the main recreational feature of the precinct. Deputy Premier and Minister for State Development, Infrastructure and Planning Jeff Seeney said the development approval was a major milestone for the project. “The approval for the Parklands redevelopment is an important next step in delivering a project worth an estimated $500 million to the Gold Coast,” Mr Seeney said. More than 1,500 jobs will be created during construction of the village, which has been designed as a mixed-use community development, to be integrated with the existing Gold Coast Health and Knowledge Precinct. “Building the Commonwealth Games Village delivers on our promise to provide better infrastructure, jobs and prosperity for Queensland families,” Mr Seeney said. Grocon is set to build the Gold Coast 2018 Commonwealth Games Village on seven hectares of the 29-hectare Parklands site, with a further seven hectares dedicated to parks and open space. Commonwealth Games Minister Jann Stuckey welcomed Grocon’s development approval. “The Commonwealth Games Village is the largest piece of infrastructure for the games and will be a hub for our city during and long after 2018,” Ms Stuckey said. Grocon Chief Executive Officer Carolyn Viney said the approval paved the way for a major transformation of the Parklands site. “The Commonwealth Games Village is of world-class design and will see a highly-desirable lifestyle and supporting infrastructure built for a vibrant new community on the Gold Coast,” Ms Viney said. 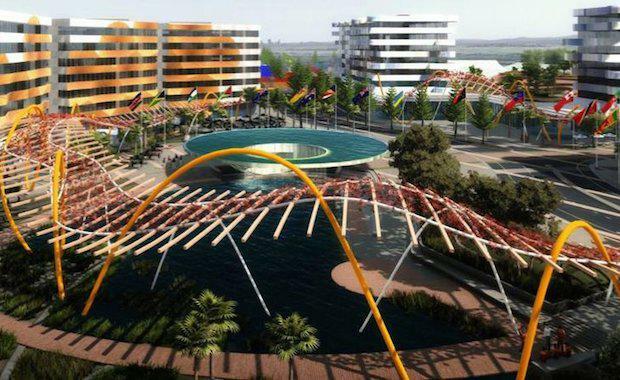 Construction of the Commonwealth Games Village is expected to start next year.